On May 1, 2001 the Post Office in Bragg Creek celebrated 90 years in business with a party and a re-enactment of a horseback delivery of mail to 450 children at Banded Peak school. The postmaster at the time, Jaquie Bishop, and her son Dale delivered special anniversary edition stamped, commemorative envelops to the school. 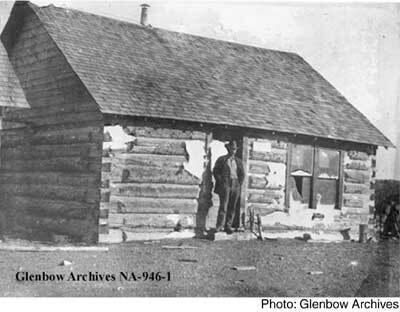 Bill Graham with his wife and family, arrived in Bragg Creek about 1909 and settled on the the land where the Saddle and Sirloin Ranch is now located. A man named Ira Johnson lived there during 1908, staying less than a year. This is the area where Albert and John Bragg lived when A.O. Wheeler surveyed and named the area. 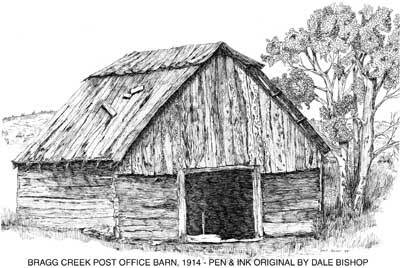 Graham had a fairly large log house on a steep hill, overlooking the creek. The kitchen of this house also served as the first post office. For the first six months, Bill’s cousin, Wesley Fitzgerald carried the mail to and from Jumping Pound, before Bill Graham took over. Jumping Pound post office, Alberta. Bateman brought the mail out from Calgary, where Graham picked it up, usually on Friday. The route to Jack Bateman’s home and post office in Jumping Pound could scarcely be termed a “trail” as it traversed bush, hillsides and muskegs with a few muddy creeks to ford. 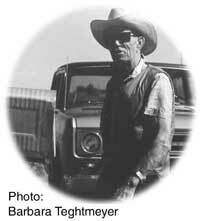 Sometimes when the weather was nice in the summer, Bill Graham used a team and democrat or in the winter, team and sleigh, but more often it was a saddle horse and a pack horse on land. The store on the left was the first Bragg Creek store. It was built by the “Spike” Robinson family and was later operated with a post office by John and Mary Wilson from 1927 to 1929. At the same time, the store on the right, a general store and tea room, was operated by Guy Coates. He had a disagreement with the owner, Jake Fullerton, deciding to build his own store out of the picture on the left, on the other side of the Wilson’s store. That store was built in two weeks during the winter of 1927. It later became the Trading Post (see below). In the spring of 1928 the store on the right was moved upstream to the other side of the bridge spanning the Elbow River. (This photo is taken from the bridge). A new two-story structure was built in its place. Two buildings and the bridge were lost in the flood of 1932. The building that is now the Trading Post was built in 1927. It survived the flood. First Bragg Creek store (in the trees at far left) was operated with a post office by the John Wilson family. The two-story store, on the right, was built and owned by Jake Fullerton, operated by Freda Fullerton and later by the Frank Badley family. This was a large building, probably 30 x 30 feet, with nine foot ceilings on the first floor. It took about a year to build. The first bridge over the Elbow River, built by the government is on the right. All three structures were washed away in a 1932 flood. The flood killed one person and changed the course of the Elbow River. This photo was taken in 1929. 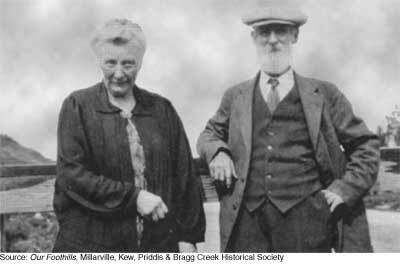 Mary Strong (1861-1954) married John Wilson in 1883, in England. They emigrated to Sarnia, Ont. in 1884 and then to Alberta in 1890. They built a homestead near the present Provincial Park. 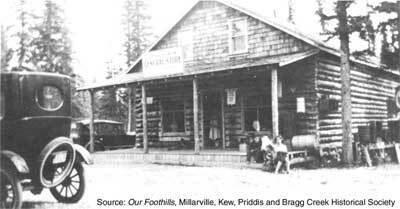 In the late 1920s, they rented the homestead and took over the little general store and post office in Bragg Creek. They operated the post office from 1927 to 1929 when Mr. Wilson was forced to retire due to ill health. Jack Elsdon carried the mail from Calgary to Bragg Creek between 1941 and 1976. 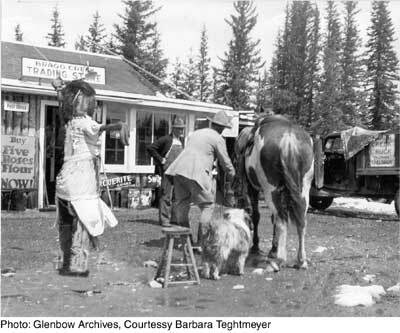 The Upper Elbow General Store was built buy Guy Coates in 1925 and operated by his wife, Tina, until 1940, when it was sold to Jack Elsdon who renamed it the Trading Post. The store is now (2017) run by his daughter Barbara Teghtmeyer. Mr Elsdon was engaged by Canada Post to bring the mail out from Calgary for 36 years. He delivered mail to all the homes along Twin Bridges Road which became RR#1 (Hwy 8). Camp Gardiner was also part of his route. Lu-Lu Belle the scarecrow stands by, while Sydney Connop prepares to leave White’s “Trading Store” with his mail, in the 1930s. The store was bought by Jack Elsdon in 1940.Harry and Ida May White arrived in Calgary about 1910, from Ottawa, Ont. Suffering ill health; Harry was advised to move to the foothill country.In the spring of 1916, Harry and Ida May took over the post office and mail carrying job which they continued for 23 years on-and-off. The mail was still being carried from the Bateman post office at Jumping Pound, so it was a particularly arduous trip for Harry each week with team and democrat in the summer and by sleigh in winter.Some residents rode as far as ten miles to the White’s store (now the Ice Cream Counter) to get their mail. They often had to wait two to three hours for it to arrive. The mail then had to be sorted and the letters date-stamped, so the yard outside was often full of saddle horses and teams tied to trees and fences. The mail bags were opened and damped on the floor of the living room then the sorting took place. As each piece was sorted, it was handed to waiting people until the job was finished. Some residents carried their mail home in gunny sacks; in flour or sugar bags and some used waterproof army kit bags which had ties to loop on a horse saddle.Ida May and Harry White Ida May White (far left & lower left) and Harry White (right), with friends, in an automoblile with a 1912 Alberta licence plate, number 12. The Whites ran the post office during three periods, for a total of 23 years, between 1918 and 1953.